Last weekend I finally got the chance to go along to one of North Yorkshire and Teeside Clandestine Cake Club events. My friend Heidi is the group organiser but I’ve never actually been to one of her events. They’d always clashed with other things going on. ssyLife has calmed down here a little in the SmartCookieSam house. We had a hectic few weeks with our holiday visiting family over in Canada, then it was busy at the end of term. It’s taken me a while to wind down. It’s been great to chill out at home as well as trying to get all those annoying little jobs done that never seem to get done at other times of the year. My house is the cleanest and tidiest it has been in a long time, well it is if you ignore my two teenagers’ messy rooms! I was pleased I could get along and enjoy cake, drinks and a good old natter with the other members who I hadn’t got the chance to meet up with before. The event this time was held in a popular pub in Redcar called The Lobster which does great food. One to try again if I’m in the area. Heidi had chosen the theme of Alcholic Cakes being as we were in a pub. I was originally going to bake a White Chocolate and Limoncello cake but I didn’t want to go out and buy a bottle of Limoncello especially for the cake. It’s not something I really drink. I did buy some once on holiday in Rome a few years back but it ended up in several trifles over the next few months or so. I had to chose a cake that would contain something I already had in my drinks cabinet or something I knew we could drink the remainder of. Thinking of Italy and limoncello got me thinking about another, more recent trip to Italy. This time I was thinking back to my 40th birthday trip to the Italian Lakes and to Venice. I remember Mr SmartCookieSam and I enjoying a Bellini cocktail outside a cafe in Varenna on the banks of Lake Como. I haven’t drunk one since though they are easy to make with prosecco and peach juice. 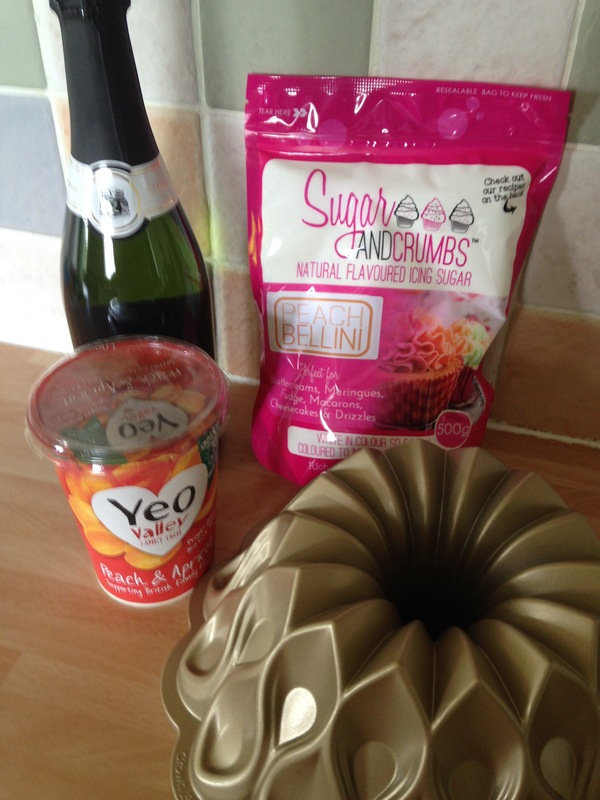 I found that Sugar and Crumbs had brought out a limited edition flavoured icing sugar as part of their summer range, so the idea for a Peach Bellini Bundt was born. 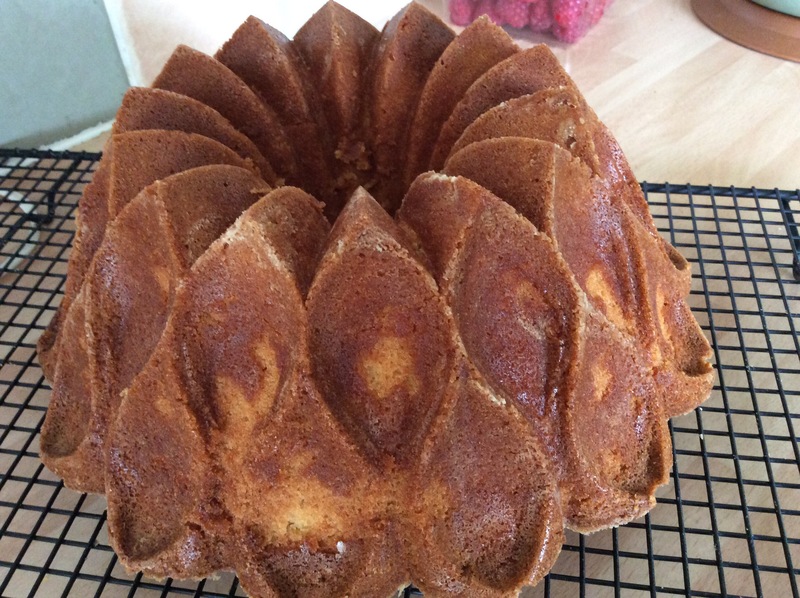 The recipe I used was adapted from a Pink Champagne Bundt cake recipe featured in the second Clandestine Cake Club Cookbook “A Year Of Cake”. In this recipe all I had to do was substitute the pink champagne for about 300ml of Prosecco. I chose the cheapest Prosecco that Morrisons did which was about £5.99 and luckily there was half a bottle left after I’d finished baking the cake! The ingredients that got used in my Peach Bellini Bundt Cake. It was the perfect opportunity to try out my latest bundt pan which I bought when over in Canada. My brother and sister in law took me to Williams Sonoma which I guess is like a US/ Canadian version of Lakeland. I was in bundt heaven and had I got more room in my suitcase I would have bought more! I came away with the 70th Anniversary Bundt pan and the giant snowflake one which was perfect. 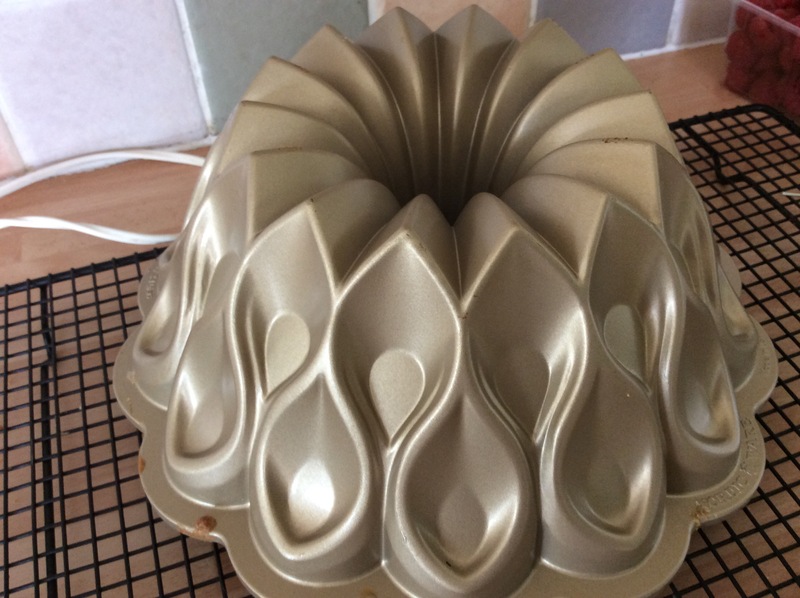 I hoped and prayed that the bundt would come out of the tin in one piece. Yippee! It did, except for one tiny piece. I’m always careful and meticulous when greasing my bundt pans but this still gets me worried every time I bake a bundt and it doesn’t come out of the pan. I have my usual praying it comes out of the pan in one piece game and if it won’t budge I have to give it a good thump. 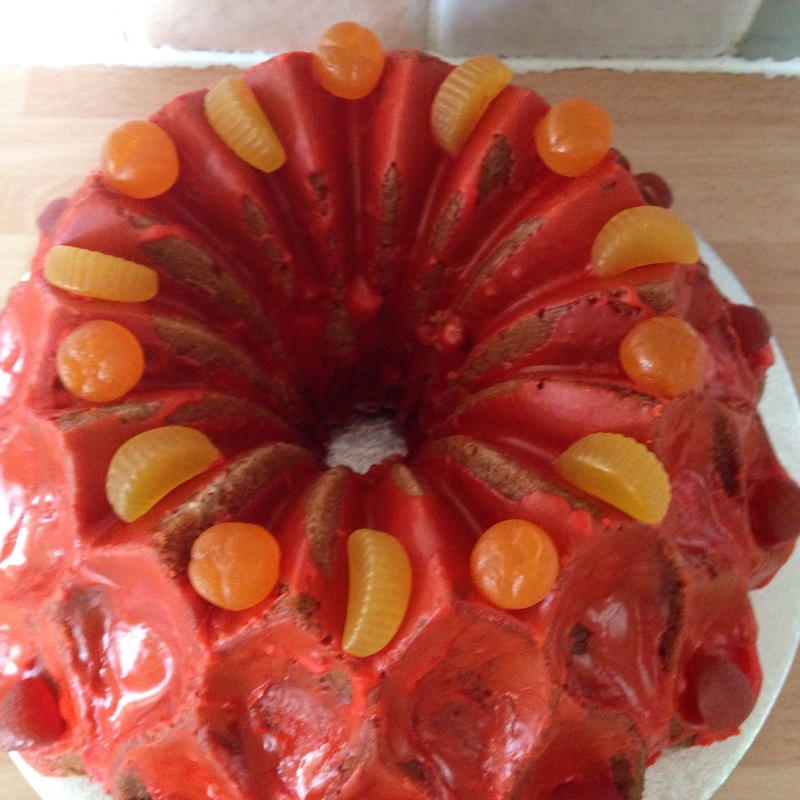 Today the bellini bundt thought it wasn’t going to come out until I thumped the top of the inverted tin on the wire rack. Fortunately, except for one tiny piece, it slid out in one piece! A miracle! When the bundt had cooled I started on the Peach Bellini icing. I opened the packet of icing sugar which was conveniently exactly the amount I needed to ice the bundt. This was 500g which I was pleased about as I don’t like waste. I added a splash of prosecco and a spoonful of water to the icing sugar. The consistency came out just as I liked it. The icing, though was white and I wanted my icing to be a peach colour like a Bellini. There was one thing for it, to get out my food colouring. I can be a bit heavy handed with the food colouring and today was no exception. Two drops of red, one of yellow. Only the red drops were too big, more like blobs! This meant it came out a very dark orangey red. I was really annoyed with myself. I couldn’t make any more up as I didn’t have any more Bellini icing sugar. How embarrassing. I could just see everyone looking at the horrible colour and be put off eating it. 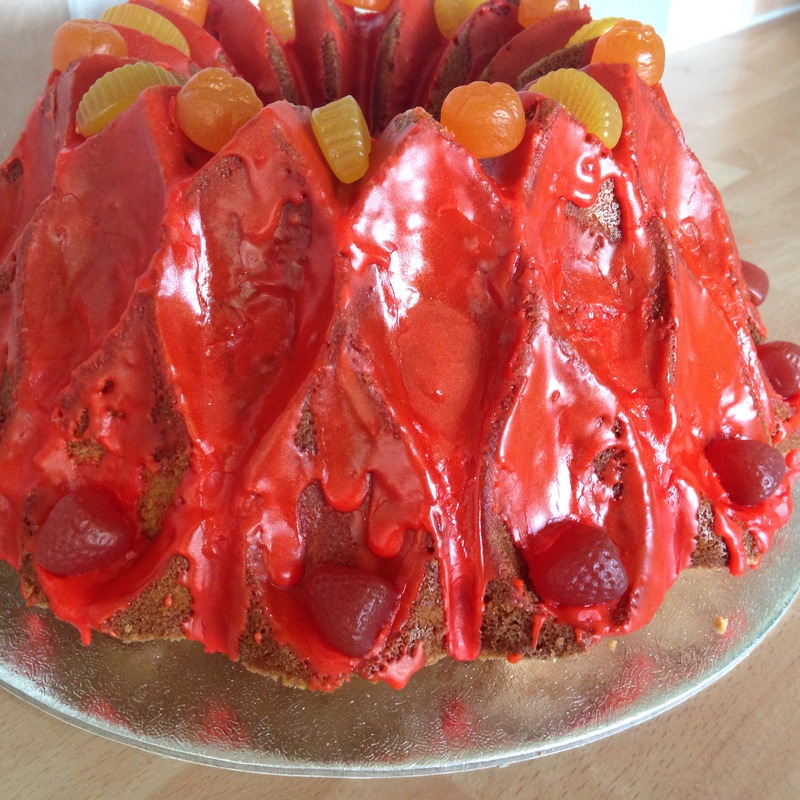 There was nothing else I could do, but to carry on and decorate the bundt with the luridly bright icing! I laughed it off, even when Mr SmartCookieSam said the cake looked like a road accident! I got a bit too heavy handed with the food colouring! On Saturday afternoon, it was a quick and easy drive up from my home near Boroughbridge to Redcar and the cake survived the journey without slipping and toppling over in the boot. I had to put the cake in one of my massive cupcake boxes as they were the only ones tall enough for the height of the bundt. Everyone was joking about the size of my cake box and laughing about how much cake I could fit in to take home! All the cakes I tried were absolutely scrumptious and mine didn’t taste too bad, despite the bright icing. Thankfully people did taste it and ignored the loud colour! Next Post Icelandic Marriage Cake.